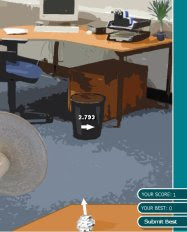 Meant to be a time-killer for bored employees in a cubicle farm this is an easily adaptable one switch game. Just set your switch to left mouse click, press to aim, release to throw and enjoy! Age appropriate for older switch users. Basketball Jars/Bottles - using large clean clear plastic jars or bottles (i.e. mayo, peanut butter water bottle or new dollar store jars) make Basketball sensory jars. Option one: offer students small objects to sort into "you find it at a basketball game" or "you don't find it at a basketball game" include things like a small toy basket ball, pieces of a cut up net/hoop, pop corn, a mini sneaker, cheerleader pom pom, etc. 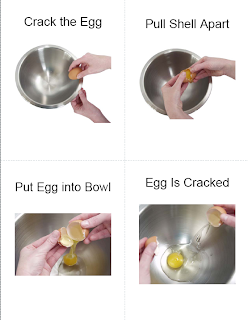 once objects are sorted put into jar and hot glue the lid on. Option 2: fill a water bottle with 10 parts water or clear corn syrup. Add beads and confetti from the craft or party store in a basketball theme. Hot glue the lid on and shake away. Sensory Bottles Link. work on personal information by making "Basketball Trading Cards" that include name, birth date and other "stats"
collect various objects about half of which are spheres and half of which are not sort them into "ball" and "not ball"
Ablenet has announced its new switch interface, Hitch, which will be ready to ship in July. Hitch needs no software to be installed (fantastic for those of us who do not have administrator privileges on school computers), can control one to five switches and can be used as a switch driven mouse emulator set to up arrow, down arrow, right arrow, left arrow and enter. Bonus: Hitch can be set up to make switch hits act as certain function keys (F3, F5, F7, F8) which in secret code means you can use the Hitch to run Clicker5 (which uses F7 and F8 for switches). Until now you had to use a proprietary Crick Switch Interface to use switches with Clicker5 (which was annoying). Yee-Haw! Hitch will retail at $99.00 (Sixty bucks cheaper than the Crick Switch Box). Widgit Point is new software that allows website owners to add symbol support for their websites. Visitors to sites that use Widgit Point need only hover their mouse over a word and the symbol or symbols for the word will appear. You can see it in action on the Ability.net website. An introductory video and technical description are also available. 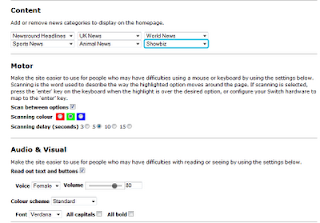 Kudos to Widgit for again harnessing the power of the web for accessibility. Let's hope this is broadly adopted! I have had a few inquiries lately about my availability as a workshop presenter and I have checked my summer schedule and actually have quite a few openings left June-August of 2009. I am also happy to design new workshops to meet your training needs or fulfill requirements for your grants or stimulus money. Consultation is also available to districts, schools and families. for rates, references and information. Silverlining Multi Media, the folks who bring us Picture This and the Picture This Addendum for Boardmaker (which I use all the time) have a new worksheet and photo card download site, Adaptive Worksheets (I can't stop myself from noticing the name's similarity to Adapted Learning). There is a limited free area with just over 30 samples to download and check out. iPrompts is an application for the iPod Touch and iPhone that offers vertical visual schedule, a countdown timer and a simple choice making utility. It is designed to replace carrying those bulky (and annoying) visual schedules and choice making boards so many of us are used to using. It has recently come down in price and now retails for about $75. This review comes from using it a few weeks in my classroom. In summary, this is a very expensive app for what it offers that is buggy, not terribly customizable and meets very limited needs. However it might be perfect for some individuals who just need those basic picture schedules and simple visual, horizontal two choice options. 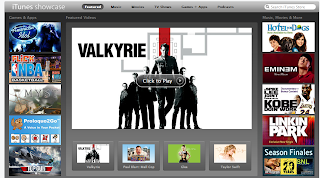 If you think it might be you should check out the YouTube tutorial video and their website, or download from iTunes. You should also consider using it with the iPhone versus the iPod for the avaliability of a camera to help overcome the lack of symbols. In some cases it may be best to spend a little more money ($75 more) and get Proloquo2Go (introductory price currently $150), then you will have a high quality, well researched AAC, fully tested application that, when place in "list" format can do the same type of visual scedule and will allow you to create endless "choice" boards (that talk with your choice a top of the line voice) and then just use the regular count down timer on your iTouch for countdowns (the only app Proloquo2Go can't currently do). P.S. That makes me wonder when there will be a Time Timer app. Wouldn't that rock? Proloquo2Go hits the big time! See that, fourth picture down in the iTunes showcase? It's Proloquo2Go! And if you go into the iTunes store from iTunes itself chances are you will see Proloquo2Go featured in the large scrolling gallery at the top. Right up there with American Idol, Linkin Park and Hotel for Dogs! Imagine what this could do for AAC users and poternial AAC users! For quite a while there has been a Teaching Learners with Multiple Special Needs Ning (online group), but I have not had time to promote it, manage it or even participate in it the way I envisioned. I am looking for someone who would like to take it over. This would look fantastic on the resume of a special education graduate student or even undergraduate major or might be a great role for many other people. Please comment or e-mail me (my address is way at the bottom of this page) to let me know if you are interested. If I can't find a taker by the end of the month I will likely eliminate the Ning altogether. 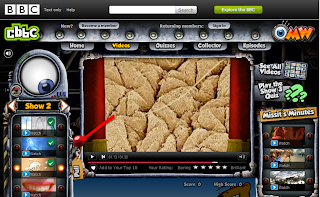 Both Help Kidz Learn and HiYah have posted new basic skills and switch activities on their sites. Just in time for those end-of-the-school year blahs. 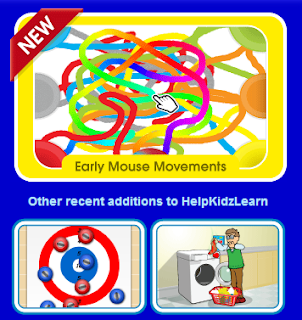 Help Kidz Learn has an Early Mouse Movements activity that also works with touchscreen, interactive whiteboard and was super fun on a Tablet PC with stylus for us. It can be set the color changes as you go over the paint spots and you can set it to have additional music or sound effects to add to the fun. Help Kidz Learn also added a two player switch curling game with is higher level than many of their switch activities both in switch skills and in cognitive ability, but is a nice addition to the library of activities they have online. Finally Help Kidz Learn has added a textless animated story called How We Used to Wash.
HiYah offers simple spacebar (or switch set to spacebar) programs about basic concepts for download or play online. They have recently redone many of there basic language programs (such as their nouns series) and added some new programs including: Spring, Yummy Tummy, The Earth Revealed...at Last!, Happy 4th of July, Colors-Basic, and Opposites-Basic. Unique Learning System, the standards aligned special needs curriculum from the folks who bring us News-2-You and SymbolStix Symbols, are offering their summer curriculum for FREE! The unit is on science and is definitely worth checking out even if you aren't teaching this summer. All you need to do is register and then you can download all the bands (grade levels). Did you know you can play BBC's One Minute Wonder Videos with play with one switch randomly? Set the mouse arrow over the lever just where that red arrow points in the picture. You will need to press play on the video screen the first time with your mouse and them replace the mouse to the lever. After that your switch set to "mouse click" will change the video to a new one randomly. Very fun on the "big screen" (LDC projector or SMART board). Our sister Stacey was a remarkable young lady. 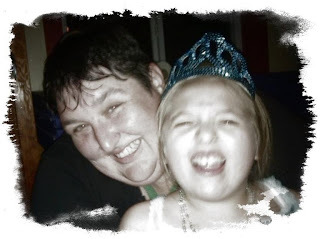 She was a disability activist and a gifted writer who over came the odds again and again. When told she would never walk, use her hands or speak she went to go on to do all of those things. When told she may never live on her on and that she would certainly never finish community college she not only lived on her own and finished community college; she also transferred to the prestigious Sarah Lawrence College in New York and, two months after her death last March, received her diploma. That was in spite of an in ability to write by hand (imagine taking math or econ without writing by hand) and a speech disorder. She was also a writer. My Blogger pal Barrie over at One Switch brought my attention to the new BBC switch accessible news reader for kids. 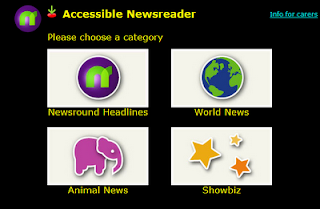 The website is a well designed interface for children, 'tweens and even teens and adults with cognitive challenges/learning disabilities to read or have read to them via text to speech the news. Seeing as it is from the BBC the site focuses mainly on UK news, which is why I would love to see PBS, NPR or PRI pair up with BBC and re-create this site with American news (and other countries do the same thing). If that can't happen perhaps News-2-You, who largely ignore access issues, could create something or Ablenet or Mayer-Johnson could leap at the opportunity (which would mean it would not be free, of course). I learned about Wijits, an adaptation to the wheels of a manual wheelchair that can benefit many wheelchair users and increase self propulsion from Elina on the Youtube video posted on Eric's Speech Pathology Sharing Site. What a super way to promote independence in some of our students! VI Curriculum is a new site from the Maryland School for the Blind focusing on adapting curriculum for learners ages birth-3 who have visual impairment. However, as you explore the site you will find that much of the content carries over into working with students of any age who have multiple disabilities including visual impairment. Some features of the site include ideas for adapting various common thematic units like "All About Me" and "Insects", adaptations for the curriculum domains and the expanded curriculum domains (including a whole section on switch use and assistive technology), the Tips for the Trenchs Make it Take it Sections with the not to be missed 10 Low Tech Ideas For a Pool Noodle, a blog, and more. Be sure to add this web site to your bookmarks!